In this day and age, when we are all the busiest we have ever been, finding time to keep a beauty regime can be difficult. We don’t always have enough time to do our hair but do want it to look thick and beautifully groomed. Spending hours in a hair extension technician’s chair just isn’t an option for some of us and this is why many people are opting for clip-in extensions. 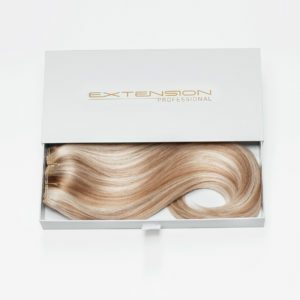 They work perfectly with a busy life style and are great for anyone who doesn’t want to commit to pre-bonded extensions. Clip-in hair extensions are easy to attach and can be perfectly matched with your own hair. They deliver longer, thicker hair in an instant. Quite often, though, clip-in extensions come in multiple pieces, making application fiddly and can sometimes look a bit stringy! Not the glam look you had in mind! This has all changed with the Extension Professional clip-in hair extensions. They are unique and are designed by Extension Professional founder and extensionist to the stars Louise Bailey. The clip-ins come in two staged wefts to give a seamless finish that blends perfectly with natural hair. They are crafted from premium quality, ethically-sourced human hair and weigh 150 grams. The Extension Professional range won’t damage your natural hair and the easy removal mechanism lets you decide whether you wear them every day or just for special occasions. For more info, call the Extension Professional office on 020 3416 5136.